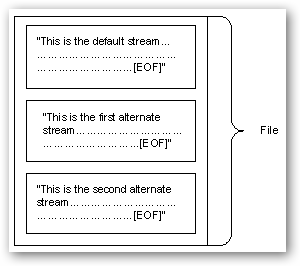 Ever since Windows 2000, the NTFS file system in Windows has supported Alternate Data Streams, which allow you to store data "behind" a filename with the use of a stream name. It’s not detectable while browsing the file system, or anywhere within Windows… you can only access it with the "secret key" which is really just the name of the stream. 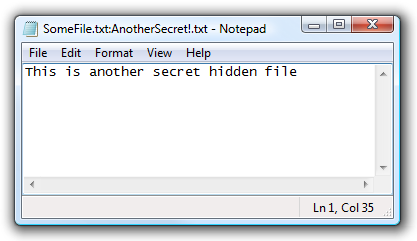 You can think of these extra streams as secret compartments within the file, that can only be accessed if you know the "secret code", which in this case is just the name of the stream. This isn’t a completely secure way to hide data as we’ll illustrate below, but it’s a fun trick to know about in a pinch. Note: This only works on a drive formatted with NTFS. You can use anything after the colon as a secret word, the key is that there can’t be any spaces between the first filename and the colon. If you didn’t specify .txt on the end, Notepad will automatically add it, and ask if you want to create a new file, even if SomeFile.txt already existed, because SecretSquirrel!.txt doesn’t already exist. 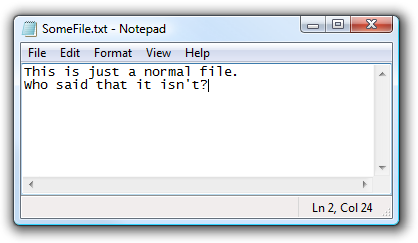 None of these hidden files will affect the other, or change the main file. Just remember you have to use the command line to access the hidden data. Note: Once you create a hidden stream, that stream isn’t exactly part of the file… you can’t copy your file to another location and access the streams over there. 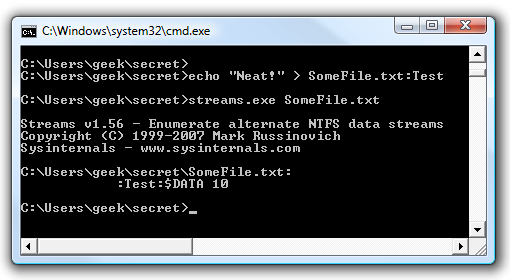 Of course these files aren’t completely hidden from everybody, because you can use a small command line application called Streams.exe to detect files that have streams, including the names of the streams. As you can see, the names of the streams are shown, which would allow you to easily access them. As you can see in the screenshot, the streams are now removed from the file. You can see with the streams command in the example above that we now have a hidden stream on the file. As you can see, the secret data that we added is outputted to the console. Botnets on mobile phones in 2009?